For all of the galleries that cluster in particular Sydney neighbourhoods, amidst posh terraces or polished concrete warehouse conversions, there is precious little evidence of contemporary artists, in particular painters, at work in our few public galleries. It's a great shame. No matter what their best intentions the showrooms, and that is what they are, of commercial galleries are scary places and it would be disingenuous to believe that a casual engagement with art is likely to flourish into something more serious under the gaze of hawkish gallerinas. As a result the public conversation around art is limited to travelling blockbusters and celebrity portraits. 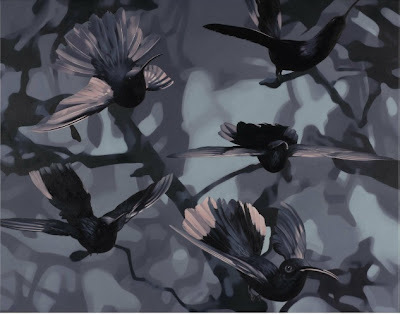 It's good to see 'Wilderness' a show of contemporary painting supported by The Balnaves Foundation at Sydney's AGNSW. 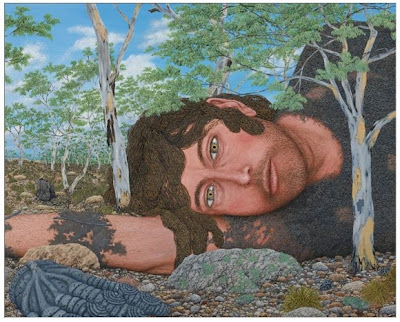 The show's title is a little misleading, the common thread between these fourteen Australian artists is not the landscape per se but figurative painting. That might sound like a pretty loose thread, but it's unusual and refreshing enough. Ground is overlapped between the various works, both in terms of theme and pictorial style. One tendency is a certain airbrushed sfumato used to render naturalist images flat and graphic. This is a technique shared here by both Andrew Browne and Mary Scott. Browne is represented by three large monochrome images of dead branches and detritus. Each is picked out in a chalky bone palette on a deep black ground. The images are suggestive of other things, animal skulls, faces, contorted limbs. However they are more reminiscent of a gothic Howard Arkley, their closest relation being the sinister enchanted forests of the Grimm's tales. Mary Scott's hummingbirds are similarly less interesting than their backstory. The large flat surfaces look like they could be rendered on a giant LCD screen as over sized birds come out of ghostly camouflage. It's somehow unsatisfactory and reminded me of giant canvas prints of frangipane flowers that you see in homeware shops. Of this fuzzy tendency the strongest showing by far is that of Fiona Lowry. Her forests are rendered dreamlike by one or two colours on a white ground in a feather light paint. One piece in particular "They come to me days and nights and go from me again" is compelling in its otherworldly directness. A full length image of a bearded naked man seems to hover in an hallucinatory forest. 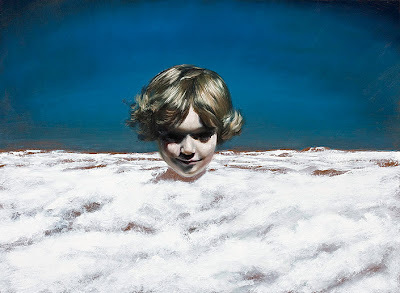 His head thrown back in a kind of ecstatic surrender he might be related to the saints of Zurbaran or Rinera or he may simply be an old man liberated from the world. It's an arresting and memorable work. The show also contains a lot of pop-art psychedelia which is more eye-catching than it is interesting. Alex Pittendrigh's big swirly canvasses look less like inner distorted visions and more like an hommage to hippy album covers and tie-dye posters and, as such, pretty pointless. More worthy of consideration, but no less ugly, are Stephen Bush's day-glo fantasia's of melting ecology. 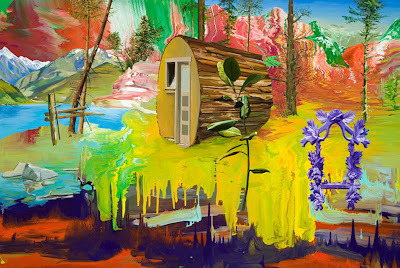 "Shout on the Hills of Glory" presents a children's book log cabin amidst dripped and dragged masses of glossy paint. It's heavy handed and not accomplished enough to convey much more meaning than 'look at me'. It's not a huge surprise that work like this should be included, it's a distorted view of landscape painting. However that oppositional stance doesn't really ring true. Landscape painting, whether the chocolate box variety or something more academic is fairly peripheral to the established canon of contemporary art, so it's a pretty soft target. The size of the works too betrays an exhibitionism that has overcome any real insight or sensibility. On artist, well represented here, who has taken on a range of pictorial conventions and created something genuinely moving and stimulating is Julie Fragar. 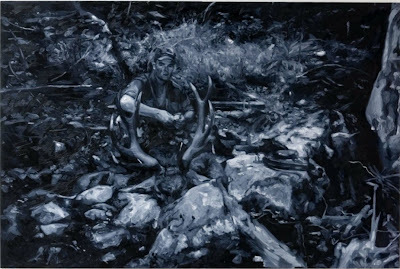 A series of works here show a man, the same in each, posing with the carcasses of animals he has killed whilst hunting. The images range in size and colour, each is painted in a loose impressionistic way, catching a sense of immediacy and drama. Each too may well simply be copies of trophy photographs, for the pose in each is familiar from those magazines such as 'Bacon Busters' or 'Boars and Babes' that are so often the object of internet mirth. Some images are then painted over with cryptic slogans, that never quite obscure the scene beneath. What makes these interesting is the blank expression of the hunter, his face a little bewildered, slightly suspicious. It's not a patronising rendering, it manages to be sympathetic, but it seems to represent an existential emptiness, perhaps even a suppressed dread. These are very good, very thoughtful and intellectually subtle works. Less easily explained but fascinating and charming, is James Morrison's polyptych 'Freeman Dyson' A man who might be clad in moss has fallen to earth, perhaps from space, maybe from another time. The piece has the same obsessive detail and illustrative quality one sometimes finds in outsider art. It shows a hyper-real world where details are so clearly rendered they seem to be demanding our attention. It's a strange and charming experience this imaginary portrait of a quantum physicist and futurist who is now in his nineties. Its real achievement is not the narrative and interpretative possibilities it opens up but how strange and magical it makes a mundane landscape seem through its almost molecular detail. It shouldn't be a surprise that so much of the most interesting work here is that which casts strange new light on people and their experience and perception of the world around them. 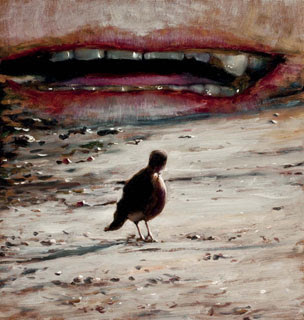 Louise Hearman's beautiful and disturbing little canvasses might remind us of the dreams of Magritte or the nightmares of Goya but they work very specifically in their own way. She isolates faces, objects and animals in fields of darkness or oddly lit landscapes. The work has a surreal sensibility but is suggestive rather than explicit, it begs questions but it's never quite clear what those questions might be. Her use of nature is effective because the subtle naturalism helps achieve that disjointed dream like association. The work is beautiful and uncomfortable, which seems appropriate for a show called 'Wilderness' as our relationship to nature hasn't been and isn't always easy. Hearman shows how we internalise nature in order to articulate things for which we have no other vocabulary, how our interiors are every bit as strange and picturesque as the world around us.